It’s known that certain astrological alignments of stars cause defeated monsters to rise as the undead. Strong rumors have it that this Halloween will see undead summonings like never before. On a positive note, hallo-zombies sometimes carry very nice loot with them, so consider meeting them as a sign of good luck. Zombocalypsis will last for the next three days – forewarned is forearmed! In other news, there are bunch of sweet features in dungeons. Their interiors have just been updated with new rooms, monsters and other goodies. Moreover, the heroes have finally learned to put treasure direction hints right on the map (which, btw, is now displayed on the fight’s log page, once exploration is over). These nice additions will surely make spelunking more pleasant. While the heroes were spelunking and collecting gopher wood, great Godville artisans have just finished the construction of a new pantheon for tracking Ark building progress. Please give a warm welcome to the Pantheon of Arkeology! Btw, if you go to dungeons using one of Godville mobile apps, update to the latest version to make sure you’ll see a bigger map. Meanwhile, the Ideabox has got a brand new section for dungeons submissions, which also includes ER. You’re surely remember that you can get a nice godpower bonus for voting in the Ideabox, right? Well, starting from today, ERers will get the same bonus too. if a hero couldn’t find a worthy arena opponent (which, as you know, happens), he’ll now be guaranteed to get a golden brick as a consolation prize (yep, without a fight!) or get the godpower back. Pretty sweet, right? Hundreds of shiny new artifacts for your heroes to pick up. Astrologists have learnt a few more new things that they are eager to share with you. Don’t miss new forecasts about godpower accumulator and arena teleportation in the upcoming issues of Godville Times. Godville invites are now more straightforward – your hero gets an invite item, then you can activate it (from now on – for free!) to increase the number of available invitations, and then you can add a friend any time your want. So no more automatic increase/decrease trickery when your hero gets/sells a Godville invite. In desperate attempts for survival, the boss monsters have developed a few more abilities. Two of them are rather nice, while the other two counterbalance them with some nastiness. In addition to the named ears, heroes can now pick other special boss trophies and some of these things will surely be of greater value than others. Keep an eye on the inventory when your champ beats his next boss. The progress meter when your hero waits for a duel opponent should now be way more accurate. And here is a good news for those who tired of “wasted” encourages when the hero is already at his full health (and opposite is true for punishments). While these outcomes can’t be removed completely, from now on they will occasionally give a nice bonus – a temporal aura of rage (or bliss for evil heroes). Lastly, rumor has it that tribbles love to make their home in mystery boxes and the like. Be careful with these things. This time around we want to talk about Ideabox. User submissions and community participation were always an integral part of the game and today we are introducing some nice perks to it. In a day or two, the players actively participating in Ideabox voting will start getting a new special bonus – their heroes will be more effective in town prayers, restoring twice as much godpower as usual. Once activated, the bonus will work for a few days and it’s likely to continue to work as long as the god continues to actively participate in the voting process. You’ll know that the bonus is active if you find a special phrase in the diary when your hero prays in town. There is some under-the-hood trickery, so mindless clicking won’t do any good, so please vote wisely! This feature is an experiment to increase community participation and we hope we won’t have to kill it off due to abuses. In the end, just keep in mind that every single vote you cast in the Ideabox helps to make the game better! To make it even better, the game has just been updated with a lot of diary entries, hundreds of new monsters, and finally it got a shipment of long awaited high-level equipment. if you use Firefox, make sure to update to Firefox 22 to get desktop notifications on superhero page (if enabled in page settings). …in a frosty kingdom predominantly famous by its bears, vodka, and balalaikas, Godville was born. It was the year of 2007 and back then Godville was mostly in Russian, just as we are (surprise!). In 2010, after several years of steady development the English Godville came to life. It happened to be precisely three years ago, which means that today is the day of our Three Year Anniversary! So, let’s raise our newly replenished remote controls and celebrate this very special and dear occasion. Long live Godville, its towns, monsters, heroes and, of course, dear gods and goddesses! May the Godville divine force be with you! Daily Astrology Forecast – Check out this new pseudo-scientific report to know what good, bad or just weird stuff is coming to your hero today. The heroes are quite credulous to astrology, so if your champion is not acting as usual make sure to check the daily forecast for an answer. Daily Crossword – Show the world your knowledge of Godville game world by solving this word puzzle AND give an aura as a reward to your hero too! The faster you solve the crossword the longer aura might work. In the meantime, spring is already in full bloom, which means it’s perfect time for Spring Content Cleaning. Check out this forum topic to suggest which game content should let go. Thanks for being with us! Happy New Godville Year! Greetings, humble Godville gods, long time no hear! We have quite a bunch of news which we are eager to share with you. Long cold nights of the past winter were spent on improving the Godville app for Android. The original app was developed back in the day when most Android phones came with the 1.6-2.0 OS version on board and due to that, the app had some inherent design limitations, which recently started to show themselves on the newer phones and tablets. We tried to improve it, but after beating a dead horse for a while we just gave up and rewrote the whole thing from scratch, and boy, do we like the result! The new app is snappy, follows Android design guidelines and should work especially great on both Android 4.x phones and tablets. It also features new color themes (with auto-switching) and a brand new app icon. The new app looks a bit different (mostly due to adherence to Google design guidelines) and may feel a bit unusual at the beginning, so please give it a try for a few days before jumping to conclusions. Feel free to share your feedback in this forum topic and report bugs and problems via the Ideabox. (The app has been uploaded to Google Play Store and should be available for update over the next few hours. Godville App in Amazon AppStore will be updated in a few weeks). Meanwhile underground bosses have become a source of endless fun, gold coins and lots of other goodies. However, digging for them could be a bit confusing, so now there is an alternative option – a new activatable artifact that sends the hero off to a search for an underground boss right here and right now. So if you always wanted to check these fights out, but were too busy to dig – here is your chance! Btw, these bosses have just gained a new nasty ability that allows them to strike twice per turn, which should make fights even more thrilling. In other artifact-related news: teleporting items will now move the hero into a random town, even if this town is far away. This opens up some interesting possibilities, right? We also have plans for two nice new towns: Herowin and Lostway, but still have not completely decided where to put them. Any suggestions? it has been decided that having a permanent set of skills in the otherwise random world of Godville is a bit strange, so healers are now allowed to occasionally replace one skill to another one of the same level. So don’t get scared when you see the result of this “knowledge exchange” operation on your champion. And last, but not least, the game yet again has been updated with lots of new content. 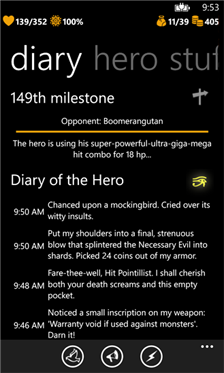 Some really sweet phrases are already pouring into the heroes’ diaries, with even more to come over the next few days. Btw, we’ve heard that it would be great if we could tell what types of content are needed most, so we’ve just created a new forum topic just for that. Check it out, especially if you’re an active Ideabox submitter. The End of The World is coming, but there is still some time left to update the game with something new and exciting. Completely ignoring the upcoming doomsday, our champions have learned a new trick – crafting! It allows heroes to make new artifacts using whatever stuff they have in their backpacks. Heroes are too lazy to do that on their own, but a proper god voice, like “combine X and Y”, should give them a much required push. Keep in mind that according to the Godville’s twisted laws of physics, only the items that start with the same letter could be successfully combined into a new item, which will also start with the same letter. Not only it could be fun on its own, it also give a chance to craft a certain item that a god might want. As the winter makes its way into the heroes’ quests and diaries, hordes of nomadic Satan Clauses with treasure bags are migrating into the Godville snowfields. Eager for presents heroes are hunting these creatures down and hopefully, even more heroes will find their gifts in the Christmas Eve. By the way, do you want to see more winter phrases in the diary? Send your texts into the “awesome idea” Ideabox section (with “[winter]” prefix) and we’ll review them out of the common Ideabox/ER queue, over the next few days! Strange things are happening throughout Godville as All Hallows’ Eve approaches the doorstep. According to recent field reports, some monsters have discovered new undead powers, forcing the heroes to kill them twice. The dark powers have reached underground bosses as well, empowering them to make profit off divine encourages and occasionally even turning everything into gold. Meanwhile, heroes are becoming more afraid of death themselves, due to more frequent reports of resurrection side effects. These can leave lingering traces on heroes in the form of a new aura. This power is capable of killing some sensitive monsters-species on the spot, taking away from heroes the good old pleasure of fighting.